Healthy Families is a home visitation program that is available to parents and parents-to-be as a support in raising their children to be healthy, safe and secure. Home visitors meet with families regularly, often weekly, in the parent’s home to enhance parenting knowledge and skills, to provide support and listen to issues affecting their family. They provide information on child development and child health as well as activities that promote parent/child bonding and attachment. Home visitors also help families access other community supports. 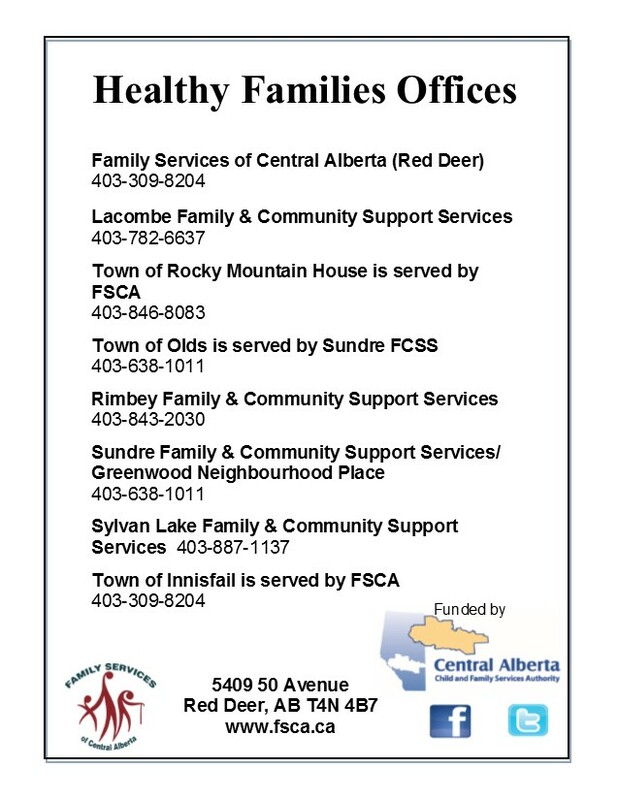 For more information on other healthy families offices in Central Alberta click here. Parents-to-be and families with babies under three months old. In some circumstances home visitation programs may admit families with children up to 2.5 years old. The Healthy Families program is offered throughout Central Alberta. Main offices are located in Lacombe, Olds/Sundre, Red Deer (includes Innisfail and Rocky Mountain House), Rimbey, and Sylvan Lake. Program is offered at no cost.